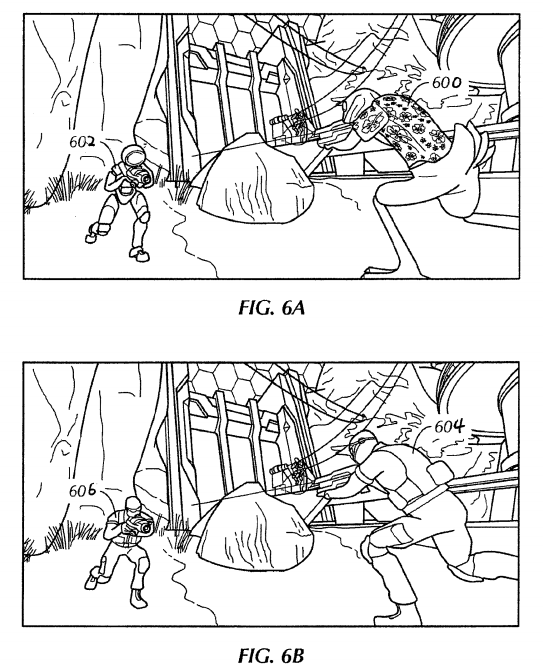 Issued Oct. 15, 2013, to U4iA Games Inc. The ‘715 patent describes a method for providing specialized content to the various users of a networked video game. The type of content can be determined by IP address, age, nationality, or any other player characteristic. Specialized content can include character appearance, sounds, and language. The primary objective of the game remains constant even where the look and feel can be customized. The customization allows a wide variety of players to enjoy the same experience. A method for providing customized content in a video game over a computer network to a plurality of game clients operated by different players is disclosed The method includes: storing a library of content that can be selectively delivered to the plurality of game clients during gameplay of the video game; receiving information about each of the players from the respective game client; selecting content from the library to be delivered to each of the game clients based on the received information about the respective player; and synchronously delivering the selected content to the corresponding game client. delivering the selected first and second contents representing a same attribute of the video game via the network interface to the first and second game clients during real-time synchronous gameplay between the two game clients.